This is a tiny addon that simply makes a list of those enemy "gankers" and then let you identify and remember later modifying their tooltip with a red background adding also a bottom note (when you move mouse over them). 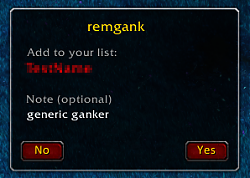 If you add a ganker without a note the "generic ganker" description is used. Since v0.3 a popup frame will appear if an enemy player killed you outside a pvp area. If you experiences some iussues try deleting \WTF\Account\YOUR_ACCOUNT\SavedVariables\Remgank.lua and let me know. - fix some global vars that should be locals. 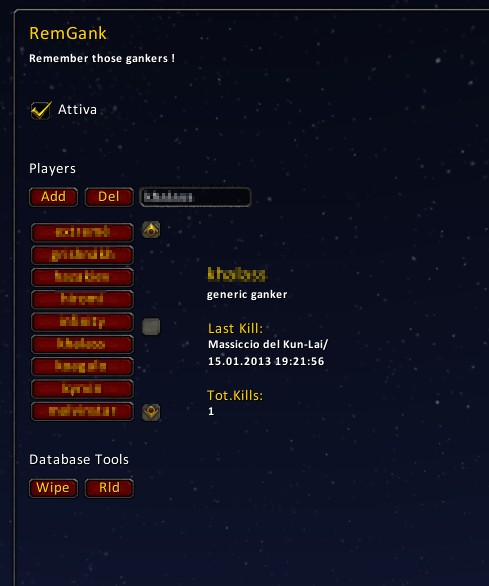 - rewrite the code of the interface to better fit "stranger gankers" long names (name-otherservername). - cleanup of the code and fix some bugs. sourceGUID:sub(1,3) == "Pet" or sourceGUID:sub(1,6) == "Player"
Now remgank uses true/false instead 1/0 for variables to reflect the CheckButton:SetChecked() change. ... or simply delete [WoW Path]\WTF\Account\YOUR_ACCOUNT\SavedVariables\Remgank.lua and restart with a fresh config. - Fixed a bug that happens when the sourceGUID to be parsed is nil or ""
- A new DB structure to store more infos such as the last killing date, the location and the numbers of kills. The DB will automagically converted the first time the addon is loaded. - Fixed a bug that occured on death by "SWING_DAMAGE". 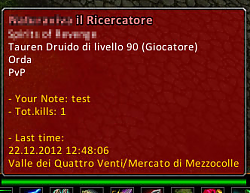 - PopUp a frame when an enemy player killed you outside a pvp area. New Bug with recent version: Every time you mouse over target from your gank list it will change all the tooltips to be red as well for every player alliance and horde and even every NPC. Last edited by Cataclysm : 09-27-16 at 06:38 AM. Last edited by gmarco : 09-23-16 at 11:33 PM. Character Limit (Number of Letters you can write in the box) is too low and you can't add Players from different realms or delete those from yours. Last edited by Cataclysm : 09-15-16 at 12:59 PM. 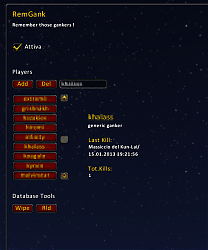 Is this addon also sharing gankers listed with friends like the old ganklist? If not is it possible to add that feature?